Background: In treating intracranial hematoma, dexmedetomidine (Dex) exhibits neuroprotective effects by preventing cognitive decline, and sodium creatine phosphate (SCP) exhibits neuroprotective effects by reducing cell death, maintaining the blood-brain barrier and improving interstitial cerebral edema. Few studies have examined the effects of Dex combined with SCP on perioperative inflammation and oxidative stress response, or recovery of neurological function. Methods/Design: Here we propose a multi-center, prospective randomized parallel-cohort controlled trial, to be performed at Anhui Provincial Hospital and Renmin Hospital of Wuhan University, China. After screening against inclusion and exclusion criteria, 80 patients scheduled to receive intracranial hematoma evacuation will be randomly divided into control, Dex, SCP, and Dex + SCP groups, with 20 patients per group. Under general anesthesia, all patients will undergo craniotomy for hematoma removal. In the Dex and Dex + SCP groups, an intravenous bolus of Dex (0.6 μg/kg) will be administered 10 minutes before anesthesia induction and thereafter intravenous administration of Dex (0.4 μg/kg/h) will be given. In the SCP, and Dex + SCP groups, 1.0 g SCP will be administered 10 minutes before anesthesia induction. The primary outcome measure is the difference in postoperative 72-hour Glasgow Coma Scale (GCS) score and postoperative 12-hour GCS score. The secondary outcome measures include differences in postoperative 48-hour and 24-hour GCS scores and postoperative 12-hour GCS score; plasma levels of inflammatory and oxidative stress markers, and pathological changes in brain tissue before anesthesia induction and at the end of surgery; and physiological indices during surgery. Discussion: We evaluate whether results from the proposed study protocol will provide evidence that the use of Dex combined with SCP in patients undergoing intracranial hematoma evacuation is feasible. Trial registration: The study protocol was registered at Chinese Clinical Trial Registry (http://www.chictr.org.cn/) on 11 December 2014 (registration number: ChiCTR-IPR-14005656). Ethics: The study protocol was approved by Ethics Committee, Anhui Provincial Hospital, China on 25 November 2014 (approval No. 2014-ethics-39) and will be performed in accordance with the Declaration of Helsinki formulated by the World Medical Association. Informed consent: Written informed consent will be obtained from patient's guardians or clients prior to enrollment in the clinical trial. Background: Numerous studies have demonstrated that a long symptomatic prodromal phase (9-12 years) exists before the onset of bipolar disorder. Offspring of patients with bipolar disorders are more likely to present prodromal symptoms compared with those of healthy parents. Methods/Design: This ongoing study is a single-center, randomized parallel-controlled trial. Eligible 120 offspring of patients with bipolar disorder, aged 10-25 years, in the prodromal stage, will be included in this study and randomized to receive psychoeducation or aerobic exercise for 3 months. The primary outcomes are changes in Clinical Global Impressions Scale scores and diagostic status from baseline to 3-month follow-up. The secondary outcomes are changes in Hamilton Depression Rating Scale scores, Young Mania Rating, Brief Psychiatric Rating Scale scores, Hamilton Anxiety Rating Scale scores, Global Assessment Scale scores from baseline to 3-month follow-up. Discussion: The main aim of this study is to identify the prodromal stage of bipolar disorder, and to propose the effective prevention strategies for bipolar disorder. 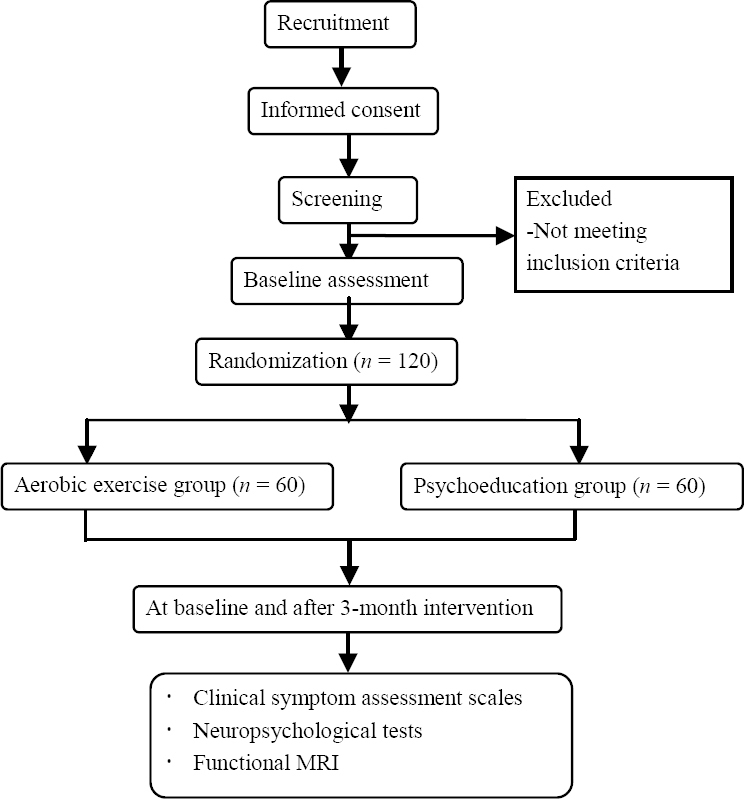 The trial results will provide important clinical evidence for the preventive effect of aerobic exercise on bipolar disorder. Trial registration: ClinicalTrials.gov identifier NCT01863628; registered on 21 May 2013. Ethics: This study protocol was approved by the Ethics Committee of Guangzhou Huiai Hospital, China (approval No. 2016048) and will be performed in accordance with the Declaration of Helsinki. Informed consent: Written informed consent will be obtained from each study participant and his/her legal guardian(s) prior to enrolment. Background: About half of patients with acute carbon monoxide (CO) poisoning suffer from delayed post-anoxic encephalopathy. Days or weeks after apparent recovery from acute CO poisoning, patients present with sudden onset neurophysiological symptoms, mainly symptoms of dementia, with a high risk of permanent disability or death. Glucocorticoids not only regulate the biosynthesis and metabolism of blood glucose, fat, and protein, but also inhibit the immune response and exhibit anti-inflammatory, anti-toxic, and anti-shock effects. Glucocorticoids can improve the clinical symptoms of delayed encephalopathy; however, the therapeutic effects of glucocorticoids combined with hyperbaric oxygen therapy (HBOT) on delayed encephalopathy after acute CO poisoning are poorly understood. Methods/Design: This is a single-center, prospective, single-blind, randomized controlled trial, which will be performed at Baotou Center Hospital, China. A total of 120 eligible patients with delayed encephalopathy after acute CO poisoning will be randomly assigned to receive either basic treatment + HBOT + intravenous dexamethasone (trial group, n = 60) or basic treatment + HBOT (control group, n = 60). Intravenous injection of dexamethasone (10 mg, once a day, for 14 successive days) will be performed. HBOT (once a day, for 14 successive days) will be administered through a multi-place hyperbaric chamber that will be pressurized with 100% O 2 to 2-2.2 atmospheres absolute within 25 minutes, followed by 60 minutes of pressure stabilization, 10 minutes of resting, and 25 minutes of depressurization. The primary and secondary outcome measures of this study will be evaluated at baseline, 7, 14, 30, 60 and 90 days after treatment. The primary outcome measure is the Barthel Index of Activities of Daily Living change. The secondary outcome measures are Mini-Mental State Examination score, modified Ashworth Scale score and European Quality of Life-5 Dimensions questionnaire score, as well as adverse reactions and death rate. Discussion: This study will be conducted to analyze the clinical therapeutic efficacy and safety of glucocorticoids combined with hyperbaric oxygen therapy in the treatment of delayed encephalopathy after acute CO poisoning. Trial registration: This study protocol was registered with Chinese Clinical Trial Registry (registration number: ChiCTR-IPR-16009743) on 5 November 2016. Ethics: This study protocol has been approved by the Ethics Committee, Baotou Central Hospital, China and will be performed in accordance with Declaration of Helsinki formulated by the World Medical Association. Informed consent: Written informed consent will be obtained from patients' relatives prior to involvement in the clinical trial. Background: Gastrin-releasing peptide receptor is particularly expressed in gliomas, while the peptide bombesin [BBN(7-14)] has the complete C-terminal structure of human gastrin-releasing peptide. Glioma-specific imaging agents can therefore be constructed from BBN, for example 68Ga-NOTA-Aca-BBN(7-14). For consideration of the clinical translation of 68Ga-NOTA-Aca-BBN(7-14), an open-label dynamic whole-body positron emission tomography/computed tomography (PET/CT) study was designed to investigate the diagnostic effectiveness and safety of 68Ga-NOTA-Aca-BBN(7-14) in patients with brain gliomas. Methods/Design: This is an open-label single-arm clinical trial that will be conducted at Peking Union Medical College Hospital in Beijing, China. Thirty patients in suspicion of brain gliomas scheduled for surgical treatment will be recruited and subjected to PET/CT via intravenous injection of 68Ga-NOTA-Aca-BBN(7-14). The primary outcome measure will be the standardized uptake value of 68Ga-NOTA-Aca-BBN(7-14) in brain glioma at 30 minutes after injection. Secondary outcomes include the diagnostic accuracy rate of 68Ga-NOTA-Aca-BBN(7-14) PET/CT, and adverse events after injection. Discussion: Diagnostic performance and safety assessment of 68Ga-NOTA-Aca-BBN(7-14) in brain gliomas will provide new insights into the specific PET/CT diagnosis of brain gliomas. Trial registration: ClinicalTrials.gov identifier: NCT02520882, registered on 2 August 2015. Ethics: This study protocol has been approved by the Ethics Committee of Peking Union Medical College Hospital in China (approval No. S-714), and will be performed in accordance with the Declaration of Helsinki, formulated by the World Medical Association. Informed consent: An informed consent will be obtained from each patient or his/her guardian prior to participation in the study. Neuromodulation techniques have been proposed as add-on strategies for modulating brain areas involved in obsessive-compulsive disorder symptoms. Trigeminal nerve stimulation is a novel neuromodulation technique, which, to date, has not yet been explored for obsessive-compulsive disorder treatment. 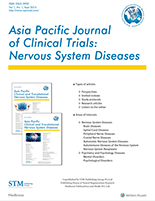 In this report, we describe a 52-year-old female patient suffering from major depressive disorder and obsessive-compulsive disorder for 18 and 32 years, respectively and successfully undergoing a trigeminal nerve stimulation intervention protocol (10 consecutive daily trigeminal nerve stimulation sessions), with amelioration of symptoms. Cognitive function was not obviously altered as assessed by the Montreal Cognitive Assessment. 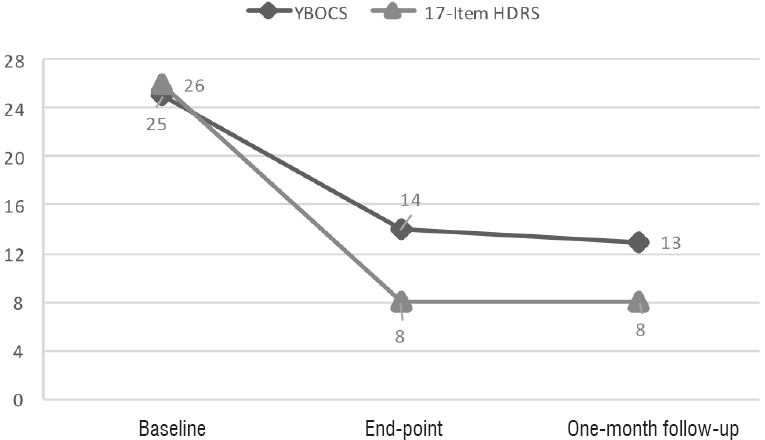 Major depressive disorder and obsessive-compulsive disorder symptoms assessed using the Yale-Brown Obsessive-Compulsive Scale and the 17-item Hamilton Depression Rating Scale substantially improved after the 10-day treatment course and remained stable after 1-month follow-up (30 days after final trigeminal nerve stimulation). The patient reported significant global clinical gains and mild diurnal sleepiness without severe adverse effects. Trigeminal nerve stimulation has been studied for the treatment of various neuropsychiatric disorders that share common functional alterations at the frontal cortex and subcortical areas, usually altered in obsessive-compulsive disorder. We present the first case report on trigeminal nerve stimulation for co-morbid obsessive-compulsive disorder and major depressive disorder. These encouraging results should be seen as hypothesis-driving for further controlled randomized trials exploring the impact of trigeminal nerve stimulation in the treatment of obsessive-compulsive disorder.